The summer heat is settled and the vines are entering their final stage of the year. They have pushed out long stems, tendrils reaching around supporting wires, foliage at its maximum size and fruit has turned from tiny, green, pea-like balls into round, plump grapes. Taste them and they are still highly acidic, sour and sharp. Pips have formed and the red grapes are just beginning to change colour. 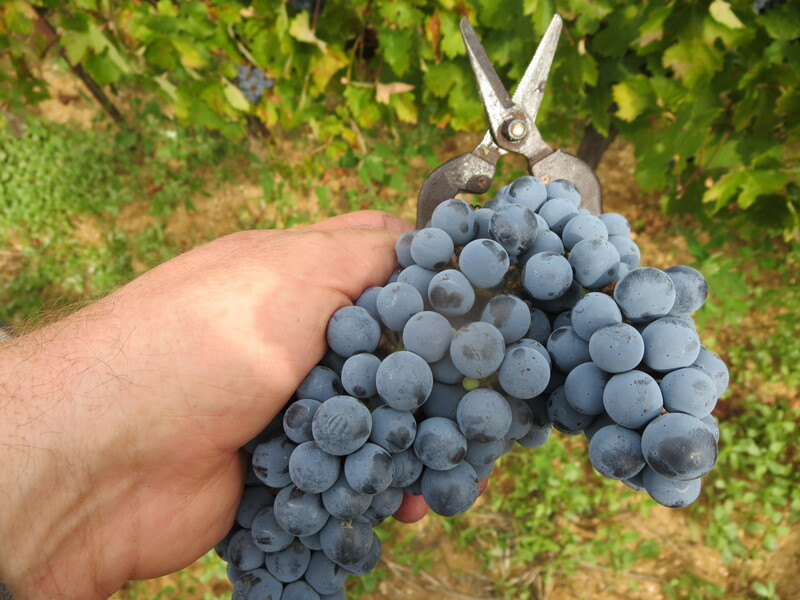 This process of véraison is one of the magical turning points of the year, the grapes are now becoming the focus of the vine’s energy. 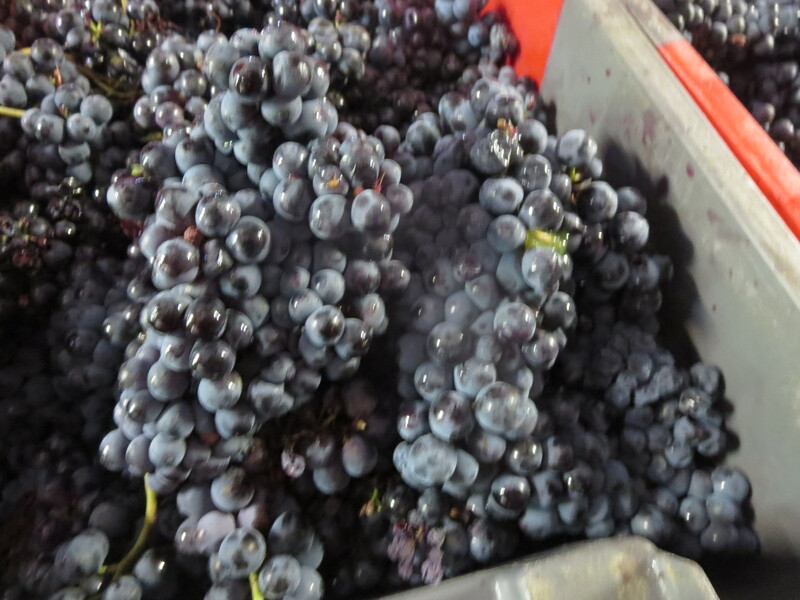 It will spend less time growing and reaching out and more time in creating sugars for the grapes. 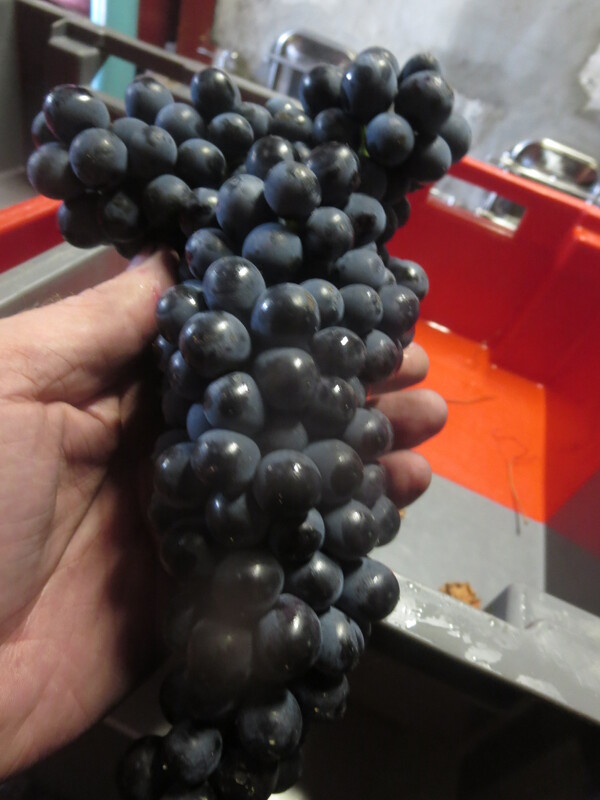 The bunches are tightening up, the grapes swelling. 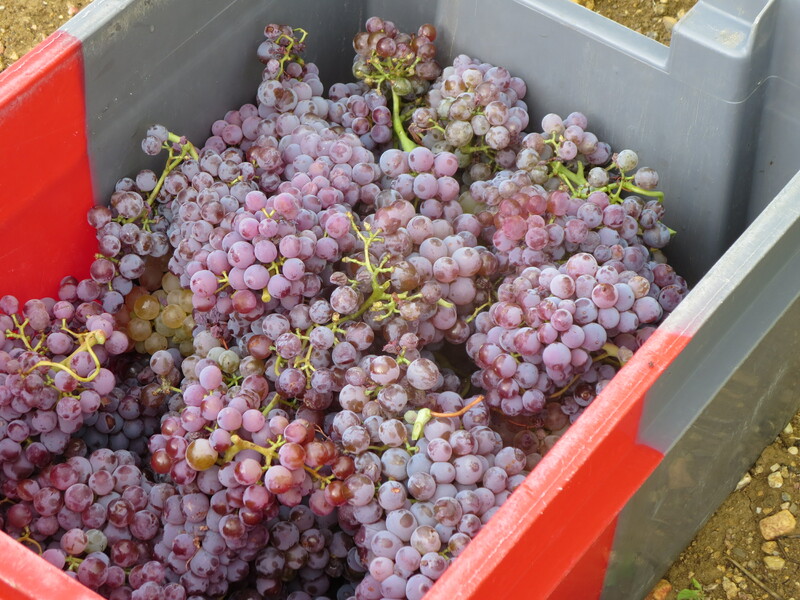 From now until vendanges they will continue to grow and to store more sugar. The reason, of course, is to attract birds and animals to eat them and scatter the pips to allow the vines to reproduce. It is humans who have learned that this energy from sun and soil can be directed to the creation of wine, we encourage the sugars to change into alcohol and the juice to become wine. Neighbouring vines to Mas Coutelou show dark green foliage, fed by nitrates. the natural evolution on this domaine means that they are a lighter colour but they are vigorous, healthy and all is set fair. Small outbreaks of mildew have been managed by a few organic tisanes. Most of the disease has formed on the new growth which has not been treated, so Jeff has been around affected areas cutting back the foliage to remove the mildew and its spores which could bring back the disease if rain splashed them onto the vines in the next few weeks. 2017 has been relatively kind, much more so than the drought affected 2016 vintage. 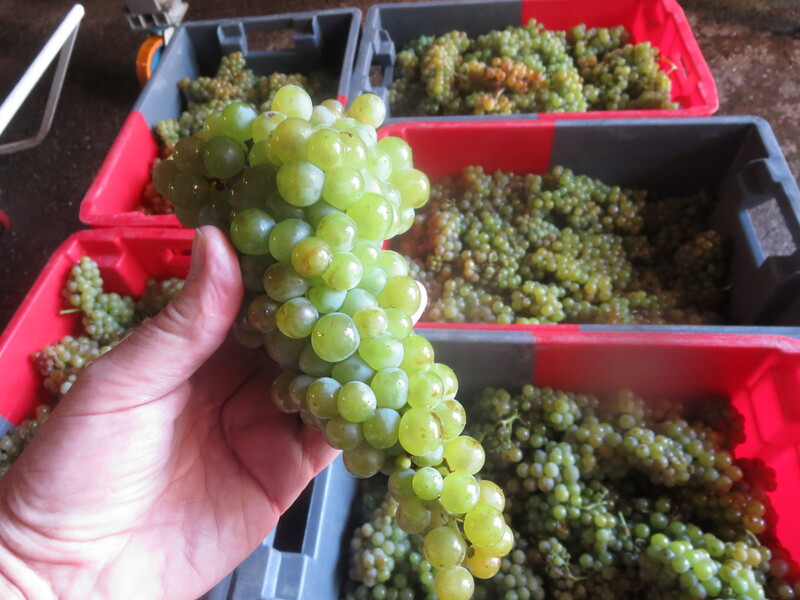 Yet other regions have been hit by frost and hail, Beaujolais recently damaged by the latter for example. 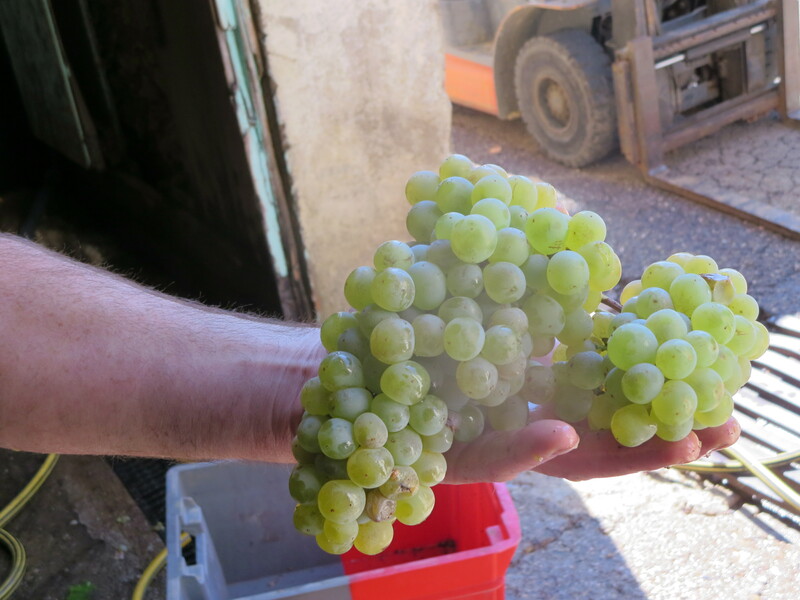 Remember it was August last year when a hail storm hit the Languedoc and wiped out much of the production in Pic St. Loup and some vines in Puimisson. So, it is still to early to say that 2017 is set fair but it is promising. The vines are a-changin’, time to start getting excited. Categories: Vignerons, Vines | Tags: La Garrigue, Mas Coutelou, Sainte Suzanne, véraison | Permalink. In Parts 1 & 2 I have tried to explain some of the difficulties encountered at Mas Coutelou during 2016 due to natural influences such as climate and disease. In this final part of the series I look at pests which have added to those woes. These are literally grape worms, more specifically caterpillars, which form and grow on bunches of grapes. The caterpillars are the larvae of Eudémis moths which prefer to lay their eggs on shiny surfaces, so grapes are the target more than the rest of the vine. The larvae obviously damage the grapes themselves but that damage is worsened because of juice running on the bunches attracting infection and disease. The warm weather and humidity of 2016 definitely encouraged vers de la grappe though it is an ongoing problem. It can be treated chemically of course though that is not an option for organic producers. Substances such as clay can be sprayed in spring to add a chalkier, duller surface to new grapes so that moths are not attracted to them. However, the solution favoured by Jeff Coutelou is to plant hedges and trees. These not only act as barriers to less environmentally aware neighbours, add polyculture to a region which can appear solely planted by vines but also they can shelter bats. Bats feed on Eudémis larvae and moths and can eat thousands every day. Bat shelters are to be found around Mas Coutelou, eg in Sainte Suzanne and Rome vineyards. The photographs above show a vers de la grappe cocoon and, on the right distinctive holes showing where the moth laid its eggs. When the vendanges begin the pickers and sorters must look out for signs such as these but also damaged, shrivelled grapes in bunches where the larvae have been. If I could have named 2016 in the Chinese form I would have called it the year of the snail. They were everywhere. The two photos below show an olive tree in Segrairals. This was one of many which were completely covered by snails, blanched by the sun and feeding on the greenery and moisture in the tree. However, vines were equally attractive to them. I spent whole mornings picking snails from vines during the Spring only to find them covered again a day or two later. Flower Power (Font D’Oulette) was particularly badly affected with the snails heading straight for the new growth and buds in April and May. The virtual drought in the first six months of 2016 meant that the snails were desperate for moisture and food and so the healthy, young vines were too good to miss. The consequence was obvious, production of this much lauded new wine was reduced drastically, partly by the weather but equally the work of the snails. Birds and other predators would help solve the problem but the monoculture of the area (outside of Mas Coutelou) means there are, sadly, no great numbers of them. Vendangeurs and sorters must try to pick off snails as they hide in the bunches. 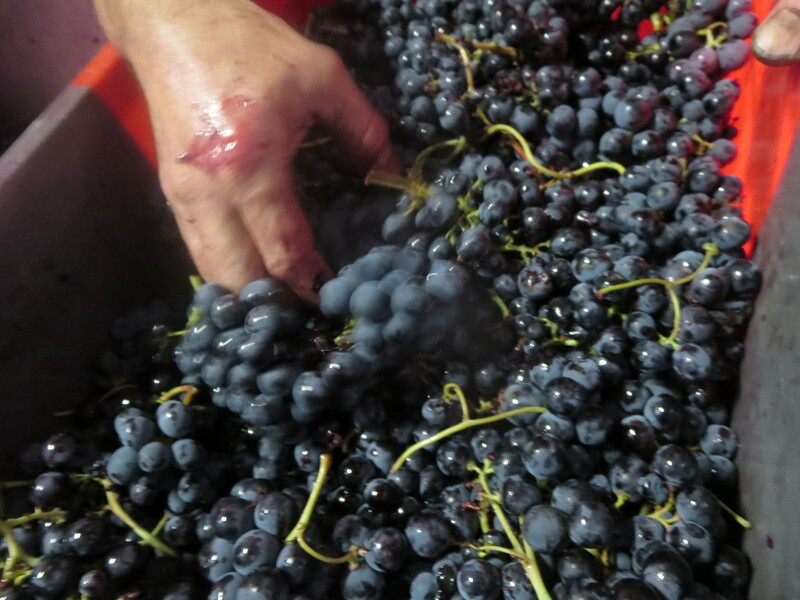 Dozens get through to the cellar especially in the early morning when there is moisture around. The photo on the right shows a lot of rejected material, leaves, poor grapes but lots of snails as you will see if you enlarge it. Just imagine how many get through into the wine with machine picking and limited triage. Yes they can be included under the title of pests. Well, one of them can be. 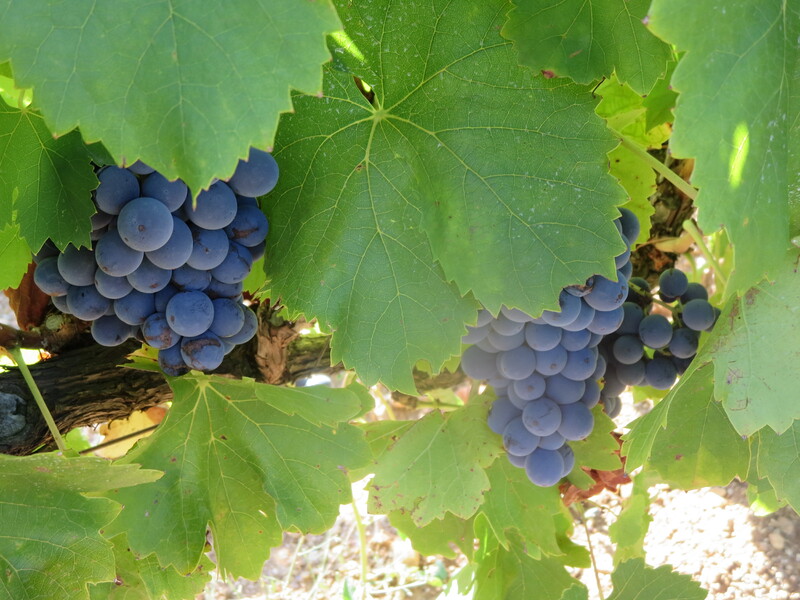 As regular readers will know 2016 has been punctuated by two occasions of vandalism by one particular neighbour, both upon the Carignan Noir vineyard of Rec D’Oulette. First he mowed a patch of wildflowers which Jeff had sown to encourage insects and birds (for reasons identified above). Then he took a machine to some of the young trees Jeff planted around the vines, destroying four year old trees such as hazelnut. Jeff was justifiably upset by these attacks. He was simply trying to enrich the area, bring diversity to it but that was clearly too much for a traditionalist, more used to destroying wildlife for his own short term gain and dreadful wine. However, he was encouraged and revitalised by the massive support of friends and colleagues around the world. The flowers grew back and more densely, the trees replanted in greater numbers and Jeff Coutelou stands tall as the man trying hard to improve the reputation of Puimisson and its wines. Categories: Vignerons, Vines, Wines | Tags: bats, Eudémis, Flower Power, Font D' Oulette, Jeff Coutelou, Mas Coutelou, monoculture, polyculture, Puimisson, Rec D'Oulette, Rome, Sainte Suzanne, snails, ver de la grappe, vers de la grappe | Permalink.